This holiday season the Record-Herald encourages our community to try not to focus on the trivial matters that sometimes complicate such a wonderful time of year, and instead use your time and energy to spend time with family, friends and all the ones you love. In that same vein, we also encourage our readers to share with us some of your favorite Christmas memories. These can be time-honored traditions or specific memories that are special to you. What does this season mean to you and how do you celebrate it? These memories will be included in our annual Christmas Greetings section that will publish in the Thursday, Dec. 20 edition. Also, if your little ones have letters to Santa they would like to publish, please also submit those and they will be included in the Christmas Greetings section. Special Christmas recipes will also be accepted. 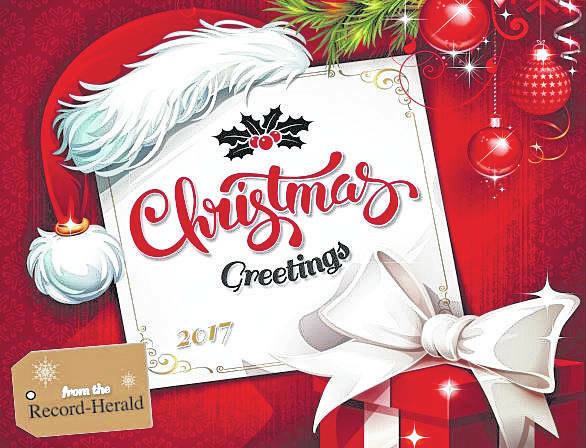 Please submit your Christmas memories, letters or recipes to Record-Herald Editor Ryan Carter at rcarter@recordherald.com. Please have these submitted by Tuesday, Dec. 11.